The Fellowship was fortunate enough to obtain a copy of RESIDENT ALIEN #0 from Dark Horse Comics. The story is by Peter Hogan with art by Steve Parkhouse. This issue reprints chapters 1 to 3 of RESIDENT ALIEN: WELCOME TO EARTH, originally published in DARK HORSE PRESENTS #4 - #6. All Dr. Vanderspeigle wants is to be left alone. The police interrupts that privacy by arriving at his cabin to ask him to inspect a victim of murder…the town’s doctor. Before he knows it, he’s asked to take over the practice by the mayor. He realizes that he enjoys interacting with the townspeople, especially the secrets they hide. However, Dr. Vanderspeigle has a secret too…he’s an alien who crash-landed here three years ago. I really enjoyed this book, especially the look and the feel. The ongoing series should be very good if this issue is any indication. You have the whole mystery of who killed the town doctor. Is the killer also responsible for “the accident” that was mentioned? In addition, you have the whole back-story of “Dr. Vanderspeigle” that needs to be told. Why did he leave his planet and where was he going? I hope that we will find out the answers and more. 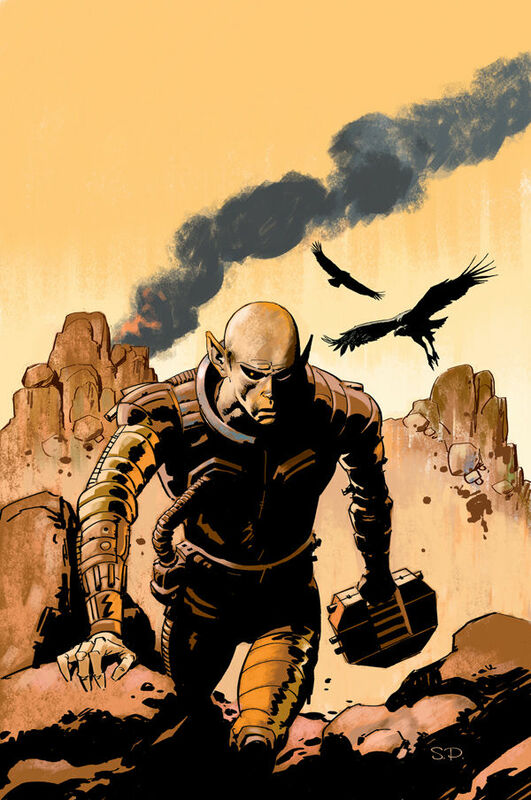 RESIDENT ALIEN #0 is in comic book stores now or available at www.darkhorse.com.